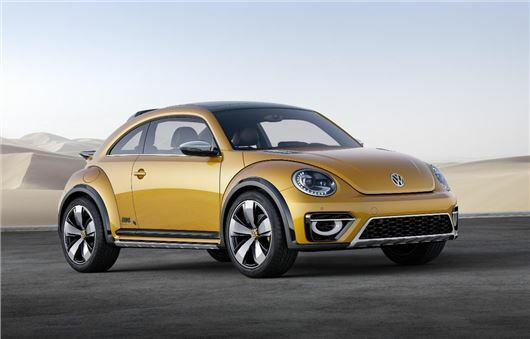 Volkswagen has premiered the Beetle Dune concept at the North American International Auto Show (NAIAS). The more aggressively styled, high-riding Beetle is powered by a 210PS petrol engine linked to a DSG automatic transmission, with drive being sent to the front wheels only. That gives the game away a little – this is an exercise in style and it might well get stuck if it was tasked with a trip across the beach. The Beetle Dune wears wider wheel arches, it’s slightly longer than a standard Beetle and it rides 50mm higher. It also sports redesigned front and rear bumpers and a pair of rear spoilers, one on the boot and one on the roof. The roof spoiler doubles up as a ski-carrier. Inside the Beetle Dune doesn’t differ much from the standard Beetle, however the glovebox has been replaced with a passenger grab handle and there’s plenty of yellow. Volkswagen says the car is present at the NAIAS to gauge public reaction – so if it goes down well it could make production as an alternative to stylish crossovers like the MINI Paceman.